The Brighton Cardinals were well represented at the 2013 AutoZone Liberty Bowl All-Star Game. 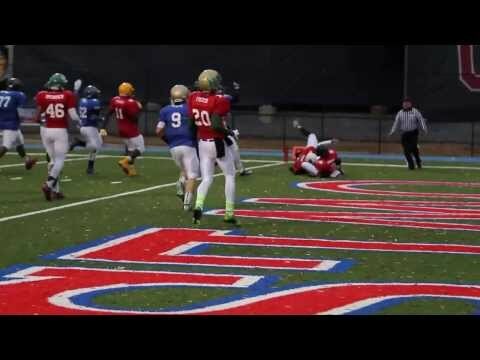 MEMPHIS – The annual AutoZone Liberty Bowl High School All-Star game was getting ugly real fast. But the 12th edition of the All-Star game would end up another thriller with the Blue Team staging a fierce second-quarter comeback. And the Blue All-Stars led by Millington Head Coach Chris Michael pulled out a 43-38 win in the bitter cold conditions. The fun started with the Red All-Star jumping out 3-0 after a Gary Wunderlich field goal. After the MUS place kicker’s points, the rest of the scoring in the first quarter was all touchdowns. The Blue All-Stars answered the Red field goal with a fast-pace drive down the field. With Blue Offensive Coordinator Will Wolfe (Brighton) shouting out the plays, Blue Team quarterback Colton Hathcock (Brighton) directed the squad to a score. Hathcock located wide out LaKeron Garcia of Millington for a touchdown catch making the score 7-3 in favor of Blue. But the Blue’s lead wouldn’t last long. On the very next play Red Team speedster Jimmy Keys Jr. of Southwind caught the kickoff at the 11-yard line. With a couple of moves, Keys was up the sideline for an 89-yard return to the end zone. The second quarter started like the first quarter with a field goal. This time the Blue Team’s kicker Dalton Young of Christian Brothers connecting. With the score 24-17 it was time for the Blue team to tie the game. The Blue Team got an interception from Germantown’s Joesph Rodgers to set up the next score. Before halftime the Blue Team took the lead. A catch by Cordova’s Marquis Ward set up a touchdown run from Craigmont’s Michael Braden to make the tally 31-24. Midway through the third quarter the Red All-Stars tied the game at 31-31 when Melrose quarterback LeEarl Patterson found receiver Gavin McCrary of Houston for a touchdown pass.